I am officially going to Colombia May 5-12. The officialness comes from the fact that I already paid for the tickets. Pretty official. My girlfriend Angelica has to go back to Colombia for a month or so to wait for her visa to be renewed, and that seemed like a good opportunity to visit the country that she has made sound really exciting. I got a bit less rosy picture of the country when I went to a doctor to talk about any health risks involved in going to South America. I left with two vaccinations in each arm, and a couple of prescriptions that I am supposed to take while I'm there. I am to avoid fresh produce, riding in taxis that already have occupants, unbottled water, people that are coughing, traveling on country roads, revolutionaries, smiling, and the CIA. The downside is that my arms hurt a little, the upside is that I am now some kind of disease immune monster. (At least that was how I felt until they told me about all of the crazy diseases that I still have to watch out for). So, that's one thing that I have to look forward to, a whole new continent.. Ooooh. I am now in Collinsville, IL for a 6 day long work trip. I had to drive my own car this time, so the chances of me doing something cool in St. Louis or somewhere else are very real. Other than that, pretty much just working on computers in a cubicle all day.. I've been so busy lately.. where to begin? I did some traveling of course. This time was a drive trip up to Grand Rapids, MI. Short and sweet. The food high point of that trip was going to a Vietnamese restaraunt, where we were the only people dining that weren't Vietnamese. Very authentic, needless to say. I just happen to have some family up there, but I didn't have any free time to go see them. Free time is very unpredictable on these trips, so I just have to be flexible. I made a proud addition to the video game museum. 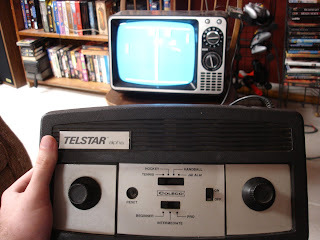 It's a Coleco Telstar Alpha, and it is at least twice as impressive as it sounds. It is my latest dirty, country auction conquest. Its got all the amazing technology you'd expect from 1977. Four games to choose from, three difficulty levels, two players. And the sound doesn't come out of the tv, oh no, friend. It comes right out of the consol itself. Bleep, Bloop, indeed. 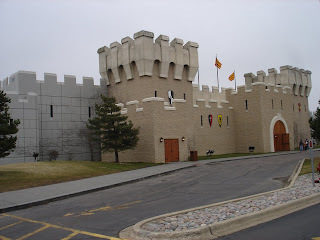 This weekend I went to Medieval Times in Schaumburg, IL. It was pretty cool. Its a dinner show, with people on horses jousting and generally fake fighting, along with other fun stuff. When you arrive, you are given tickets which correspond to a specific knight. Then there are cheering sections for each knight. Our knight dominated pretty bad. To me, the most visually interesting part of the whole thing was the large waiting room at the start of the show. 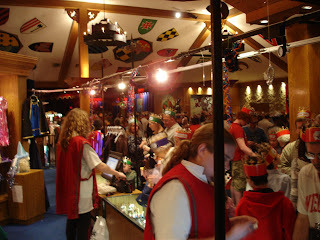 It had a casino feel to it, with costumed people selling all kinds of crap, and people big and small milled about while wearing their paper crowns. The show itself was en tertaining, and it lasted a good couple of hours. I doubt horses and lightshows mix in many places outside of that concrete castle. I definitely reccomend it to anyone who hasn't been. Its not a place I would be very interested in going to a second time, though. The Terror of Castilla rides in. The Red Knight putting a big hurt on a fool. I had a drive trip to Galesburg, IL for two days, not too eventful though, thankfully. One thing that was interesting about the place was the mall. Galesburg isnt that big of a place, so I was pleasantly surprised that they even had one. I'm not a big shopper or anything, but we needed a part and radio shack was almost the only place in town that might've had it. Anyway, the mall's interior was poorly lit, and from what I saw maybe more than a third of the spaces for lease were empty. Kind of a strange feeling, being in a mall that is mostly closed and pretty dim. Sort of a post-apocalyptic feel to the place for sure. One of the especially notable sights that Galesburg boasts is the only remaining site of a Lincoln-Douglas debate, the "Old Main" building on Knox College's campus. I didn't get to see that, but I did get to see an old school Arby's sign. Yes! I was able to squeeze a few more moments of fun out of the end of my stay in Portland. I took advantage of my rental car and did a few tourist laps around to wn. I was able to check out the Portlandia statue, which is second only to the Statue of Liberty in terms of giant, copper women. Took a cruise around Chinatown, and generally bounced back and forth over the bridges that connect the two halves of Portland together. The maps of the city that I did have kinda sucked, so I just ditched them and roamed around aimlessly. I've been really impressed by what I've seen of Portland. I wouldn't object to living there someday. All that driving around meant that I had to stop for gas. Waiting for me at the station was a trained gas dispensing technician happy to take all the responsibility. Oregon is one of two states in the union where it is illegal for consumers to pump their own gas (the other is New Jersey). Both states enacted the laws in the 40's to protect the apparently completely helpless motorists living in these states. I had no idea about all the dangers that I've been exposing myself to all these years. Not to mention the environmental drawbacks of me spraying gas all over the place like I usually do. Complete weirdness. The sort of tragedy that Oregonians will not abide. I had to take a break from traveling, otherwise I would be in West Virginia already. A different trip got moved way up on really short notice, so now I'm going on a drive trip to Galesburg on Monday. Pretty hectic these days. Today I got to go to a coin show and AND a used book sale, which is pretty much the best day ever. Hurray.